Pixton Comic Maker is one of our favourite tools for creating educational comics. We have already featured it in previous posts here in EdTech and mLearning. However, today we want to draw your attention to this handy feature that was released a few months ago. 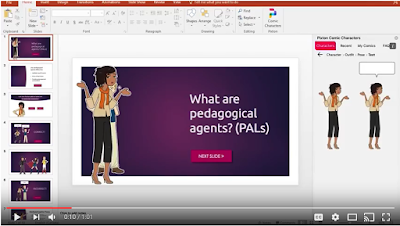 Paxton Comics add-in is an extension you can easily install on your PowerPoint and enables you to easily insert comic characters into your slides. There are over 40 thousand images to choose from and you don’t even need to have a Pixton account to start using the pre-set characters. Alternatively, you can connect your Pixton account if you have one and start creating your own customized characters to insert in your presentations. Watch the video below to learn more about Pixton Comics character add-in. For those of you not familiar with Pixton Comic Maker, this is a web tool and mobile app that allows you to easily design comic characters to use for a variety of educational purposes including: 'write a book report or other school project in the style of a graphic novel, explain a concept or idea in a concise format, tell a story with words and pictures, storyboard a movie script, depict nuanced emotions with customizable characters'… and many more. Check out these videos from Pixton Comics Youtube channel to learn more about Pixton.